Experience Mesa Verde National Park and learn about its people who evolved from hunter-gatherers into a culture known for agriculture, intricate artistry, and architecture. Your professional tour guides will explain the fascinating architectural details, as well as local flora and fauna, artifacts and natural resources and their significance to the Ancestral Puebloans.Choose from morning or afternoon half-day tours, which begin in comfortable, air-conditioned motor coaches. Short walks on simple trails take you to the earliest Mesa Top sites and to the magnificent and more adventurous Cliff Palace the largest and most awe-inspiring cliff dwelling in Mesa Verde National Park. Tours run from April through October. The Visitor Center is located at the entrance of the Park. Tours depart from the Far View Lodge, which is about 15 miles from the entrance. NOTE: Spruce Tree House is currently closed through 2019 for repairs. This afternoon Mesa Verde Tour is led by National Park Service trained guides with expertise on the culture, architecture and lifestyles of the Ancestral Puebloan people. On the Classic Pueblo Tour, you'll explore Mesa Verde, gaining insights into its heritage and discovering its spectacular sites. Learn how the native people thrived here for seven centuries â€“ evolving from hunter-gatherers into a culture known for agriculture, intricate artistry, architecture, and their possible mysterious departure. - Depart Far View Lodge at 1:30 PM with a pick-up stop at Far View Terrace. Please arrive at Far View Terrace Tour Desk at 1:15pm. - The tour is 4 hours, which includes short hikes to archaeological sites along the Mesa Loop Road and a walking tour of Cliff Palace. - Guides will share contemporary interpretation of archaeology and culture of the Ancestral Puebloans. - Our comfortable motor coaches will transport you to the archaeological sites of Triple Cities, Square Tower overlook, Sun Point, Sun Temple, and Cliff Palace. & Once the bus gets to Cliff Palace, many uneven steps plus ladders are required in order to go into Cliff Palace. If a guest is unable to participate in the Cliff Palace portion, they will miss the last 60 minutes or so of the tour. Cliff Palace is not ADA accessible, but anyone with mobility issues can stay at the Cliff Palace overlook with the bus driver and receive the same narration without actually going down into the site. The 700 Years tour provides you with an overall historical view of the Ancestral Puebloans architectural, horticultural, cultural, and religious dimensions of their lives in the Southwest. You will be taken through a chronological journey starting with the earliest recorded Pithouse villages (600A.D.) in history to the classic Pueblo era of cliff dwellings dated from the 13th century. Cliff Palace, the largest of cliff dwellings in Mesa Verde National Park, is viewed as one of the top ten places to visit in a lifetime. - Depart Far View Lodge at 8:00 AM with a pick-up stop at Far View Terrace. - Duration is 4-hours, which includes short hikes to archaeological sites along the Mesa Loop Road and a walking tour of Cliff Palace. - Guided tour, led by Mesa Verde National Park Service trained guides with historical expertise on the culture, architecture, and lifestyles of the Ancestral Puebloan people. - Our comfortable motor coaches will transport you to Chapin Mesa, where short walks on simple trails will take you to both the earliest Mesa Top archaeological sites and the magnificent Cliff Palace. &; Once the bus gets to Cliff Palace, many uneven steps plus ladders are required in order to go into Cliff Palace. If a guest is unable to participate in the Cliff Palace portion, they will miss the last 60 minutes or so of the tour. Guided coach tour for all ages. 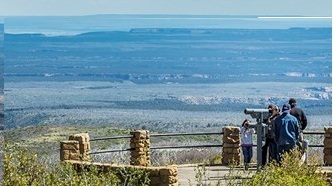 Tour includes Park Point, the highest elevation of Mesa Verde National Park. It also includes Spruce Tree Overlook, Chapin Mesa Museum and Sun Temple. 4 Hour tour. The tour does not include climbing into the ruins. Buses can accommodate a forward facing wheelchair only. No scooters (too large & not secure) steps to enter bus; Once the bus gets to Cliff Palace, many uneven steps plus ladders are required in order to go into Cliff Palace. If a guest is unable to participate in the Cliff Palace portion, they will miss the last 60 minutes or so of the tour. Cliff Palace is not ADA accessible, but anyone with mobility issues can stay at the Cliff Palace overlook with the bus driver and receive the same narration without actually going down into the site. Buses can accommodate a forward facing wheelchair only. No scooters (too large & not secure) steps to enter bus. Once the bus gets to Cliff Palace, many uneven steps plus ladders are required in order to go into Cliff Palace. If a guest is unable to participate in the Cliff Palace portion, they will miss the last 60 minutes or so of the tour. Guests will experience a chronological journey through the 700 year history of the Ancestral Pueblos. NAI Certified Interpretive Guides tailor the experience to suit your needs whether you are a family with children, or have ADA needs, yet still want the full personal adventure. Each party will select the cliff dwelling they wish to tour with the National Park Service Rangers for a one hour tour in advance of their visit. Choices are Cliff Palace or Balcony House. Dates and times the sites are open are regulated by National Park Service. Spruce Tree House Overlook and the Chapin Mesa Museum are available for guests not able to climb the ladders at the cliff dwelling tours. From Durango, please allow about 90 minutes to get there in time for your tour. Take US Hwy 160 West about 36 miles to the Mesa Verde National Park exit and follow to the Park entrance. The NPS entrance fee is $15-$20 seasonally. The Tour Desk is inside the Far View Lodge, which is located about 15 miles from the entrance. Cancellation | Cancel at least 72 hours prior to arrival to receive refund of advance deposit. Other | Cancel at least 72 hours prior to arrival to receive refund of advance deposit. 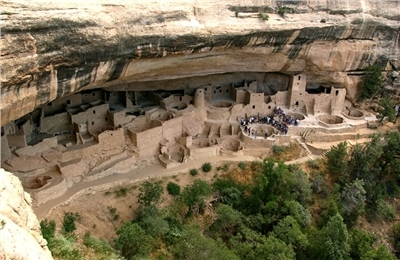 Concessions in Mesa Verde National Park are managed by ARAMARK and authorized by the National Park Service. DRIVING DIRECTIONS: From Durango - Take 160 West For 36 Miles. Take Mesa Verde National Park exit and follow to the entrance station. Unless you have a park pass, the entrance fee is $10-$15 seasonally.